We are a new rapidly growing company on the Polish market, which manufactures Bubble Mailing Bags. The company was founded thanks to the Project co-funded by the European Union in the Malopolska Regional Operational Programme. We hope that this will contribute to the fact that our company since the very beginning of its operation become a reliable partner for all our customers. We are 100% Polish company. We have a modern, fully automated production line, through which our clients can expect products with high quality and reasonable price. Our bubble envelopes are currently produced in 11 standard formats, in two colours: white and brown. We are able to perform any unusual order. The maximum size of an envelope that we can produce is a width of 45 cm and a length of 65 cm. We also offer padded envelopes packed in foil packs of 10, 25 and 50 pieces. Our air bubble envelopes are made from strong PE coated paper – 80 gsm (PE - is a layer that protects the load from moisture and dampness) and a special bubble wrap (polyethylene LDPE) with a bubble diameter of 8 mm, the bubble maximum height of 5 mm and the weight of 50 g/m2. The bubble wrap is glued to the whole surface of the envelope which ensures a better protection for the packages. 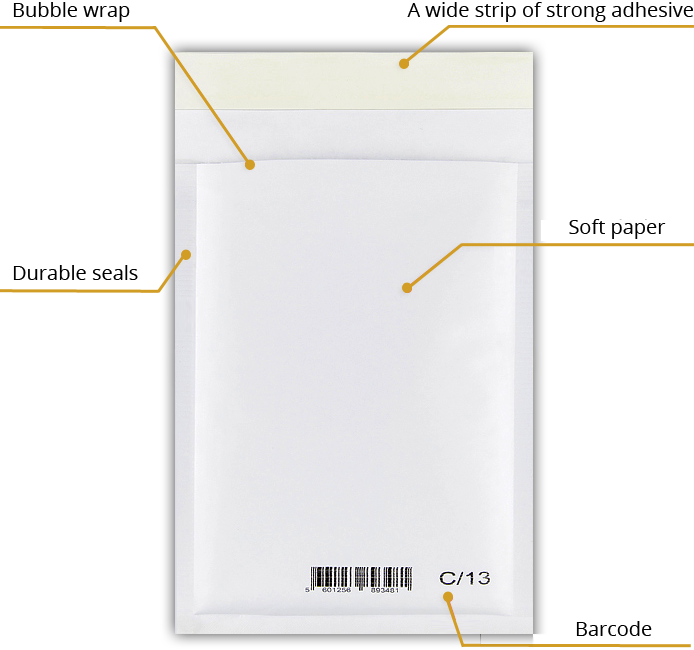 The envelopes have a strong glue part of their upper flap which is protected by a silicone strip with the weight of 40 g/m2 and a width of 15 mm and a glue layer with a width of 9mm. Padded envelopes are welded in the three edges (the sides and bottom of the envelopes). Each seal has 10mm size. Broad seal prevents from accidental tearing the envelope by heavy or sharp object. Envelopes are packed in brown cartons and have the information label. Our target is to offer you different styles and sizes of envelopes tailored to your requirements. Bubble Mailing Bags offers waterproof cushioning protection of your products. We also offer the possibility of making overprints on bubble envelopes and on ordinary envelopes. Our company produces envelopes with overprint, using offset and flexographic printing. Bubble Envelopes are ideal for the dispatch of the CDs, books, gifts, documents, electronic components, jewelry, clothing and other items. Use of such envelopes will enable your product to reach customers in perfect condition. It may also help to reduce the cost of shipment. We buy in bulk the ingredients for bubble envelopes production and therefore we would like to offer you a great range of the following products: bubble wrap, cardboard boxes, fingerlift tape, wrapping tape. We offer those products at very reasonable prices. We guarantee our customers convenient terms of cooperation, fast delivery and competitive prices. We kindly invite you to cooperation with our company. If you are interested in buying our products please contact us. We can offer a great deal. Terms and conditions are available upon your request.